Dave, alas, has departed back home, to England, and work. Our crew is a man down. But we few remaining sailors, just three now, must press on, to our next destination. That destination, our new target, is Audierne. A new chapter awaits. 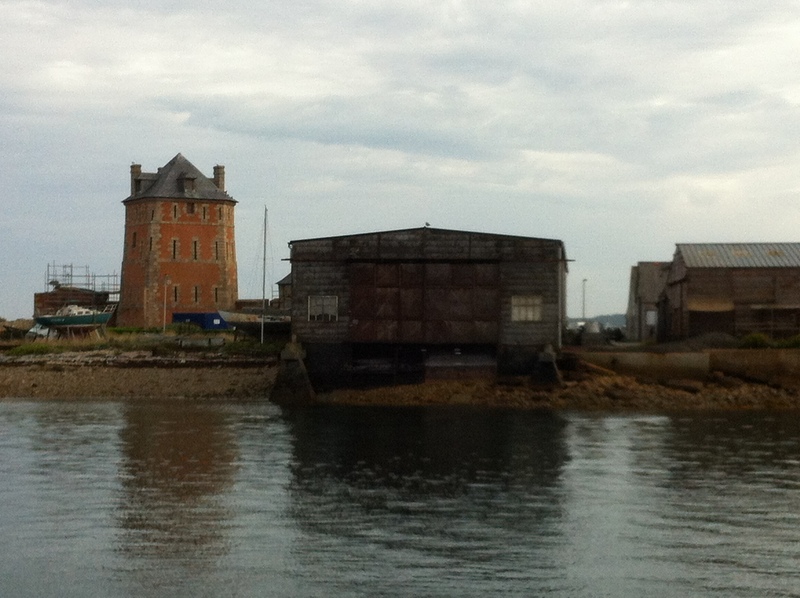 We sail out fairly early to catch the tide, passing the old red fort at the harbor mouth again. Initially it’s a chill grey morning. But after the sunny bliss of yesterday, I’m confident the day will improve. We nearly never see the afternoon. Yours truly is at the helm of White Morning, when this hefty iron-hulled tug appears, coming the opposite direction into port. It seems to be heading to our starboard side. No, it’s changed, now its heading portside, (I steer anxiously away.) Then starboard again! The guy seems determined to kill us. We miss him. But it is a close enough miss. Phew! It would have made matchsticks of our little craft. This heinous attack cannot go unanswered. It’s with a heavy heart that I open the hidden cache where we store our, shall we say, our more irregular or clandestine equipment. I take one of our heat-seeking missiles and fire a round into the tug. The morning sky lights up red, with an enormous boom, as the tug disappears. There is a gigantic fireball, and a plume of black smoke. As the burning survivors sink below the waves, we sail grimly on. Okay, (person at the listening station at CCHQ Cheltenham, or Langley, if your device has been triggered by any of the above words)… you can discount that last part. It isn’t really true. Soon we are out on the open sea again. We see more of the rocky islands and old lighthouses that make this rugged, sometimes treacherous coastline famous. Much like yesterday, we travel under a mix of sail and motor as the wind blows and ebbs. When the sails are up, its all hands on deck, reaching and tacking and all that jazz. Lindsey who grew up in a hard-core sailing family, and even sailed for her university, cannot leave her past behind. She’s a stickler for a correctly luffed sail. Hang on, is that even a word? I have a bad feeling it is a word, but I am using it incorrectly. Wait… a correctly trimmed sail. That’s it. But we draw a line at the autopilot. Fine… indeed, essential, if you’re sailing solo across an ocean, or around the world. 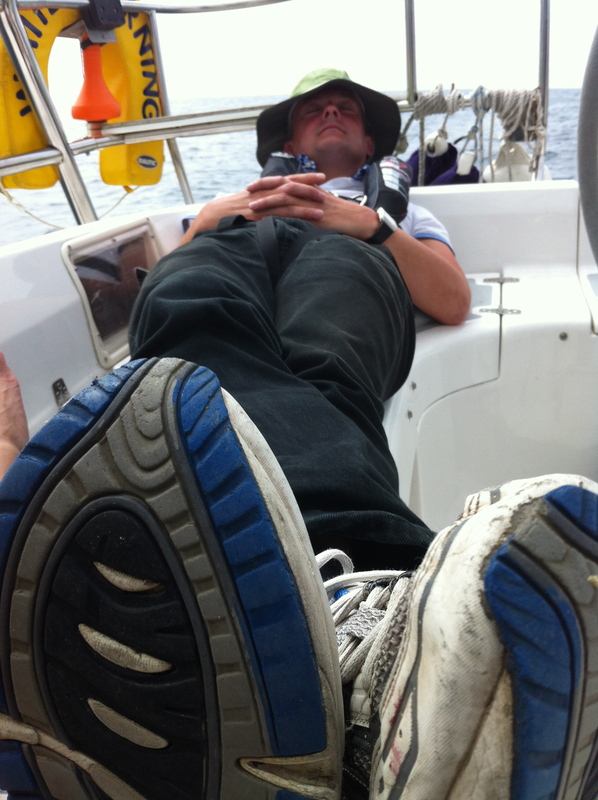 Unforgivable if you’re day sailing a six-hour hop. I mean, what’s the point? If that’s your attitude, just get the bloody ferry, why don’t you? 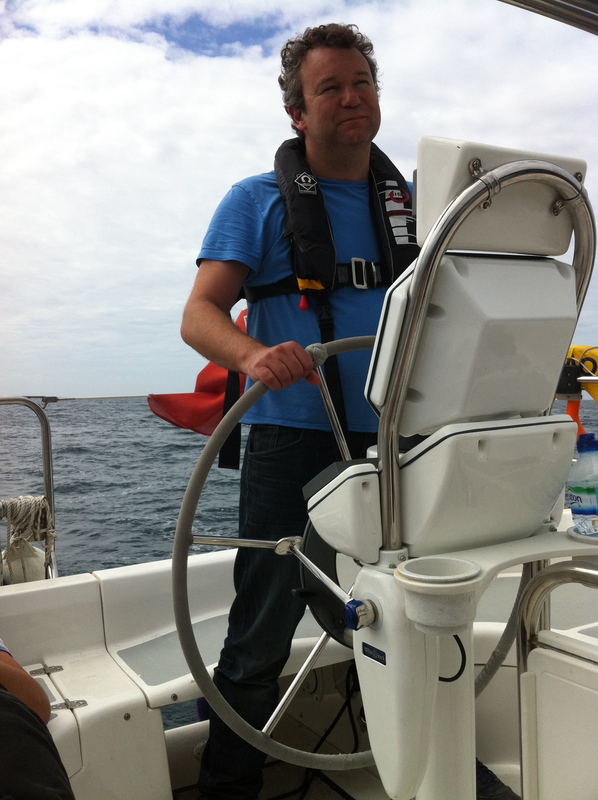 In a reversal of normal roles, I do a lot of helming today, while the others veg out, in a slack and useless sort of way. 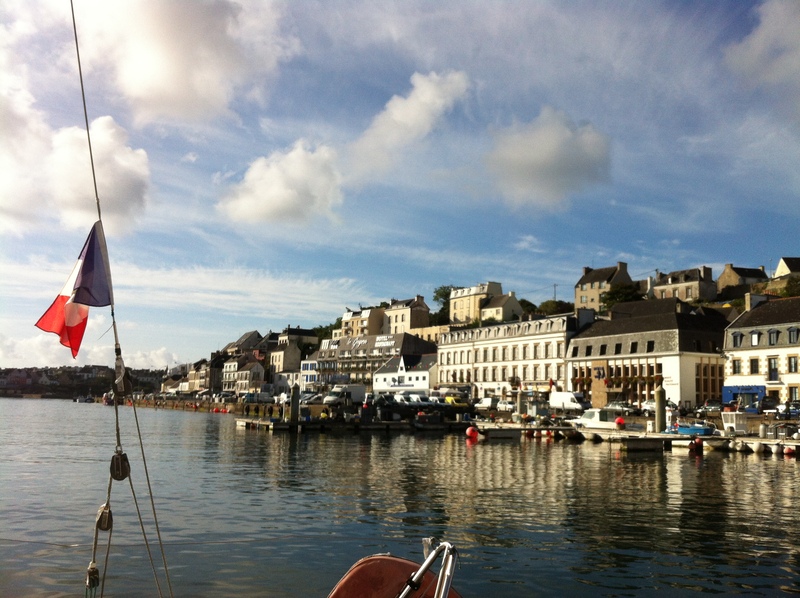 Six hours sailing later, we are coming into harbour at Audierne. I already like the look of it. 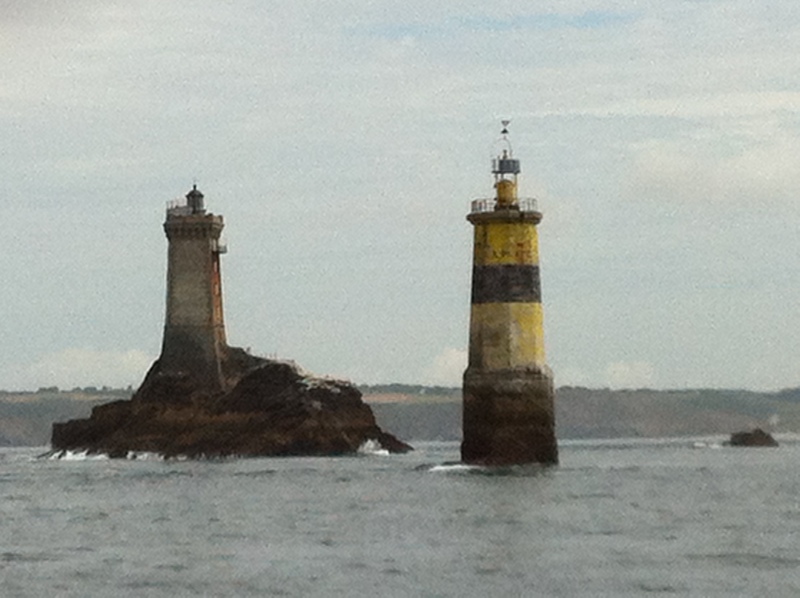 Just as Cameret sur Mer was larger than L’Aberwrach, so appears Audierne bigger and more interesting than Cameret. The town rises up on hills beyond the harbor. 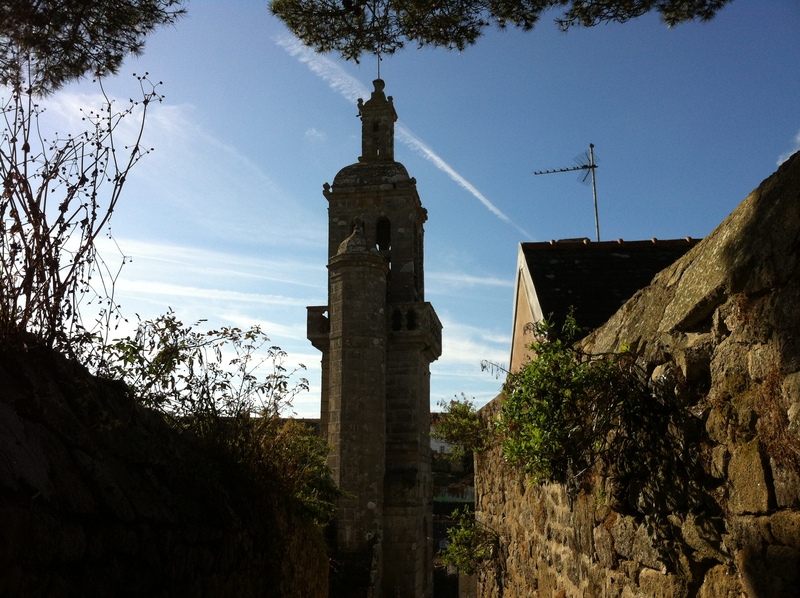 I can see the high bell towers of two old stone churches, nestled on the little winding streets above the port. This is more like it. In fact, as we sail into harbor, as our perspective shifts on the moving boat , the two distant towers obligingly align for a moment, in a rather ascetically pleasing-sort-of way. It’s also pleasing the way the estuary at Audierne narrows, ending in a V-shaped harbor, meaning the town is on both sides of us. The marina lies neatly sandwiched between the two parts of the town. We feel right in the middle of things. 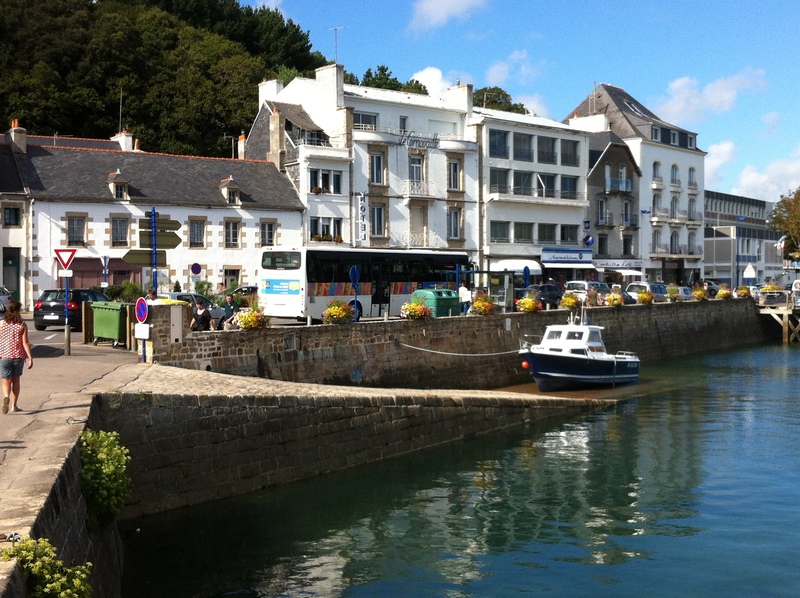 The waters of the harbour approach narrow, until with a few vehicles and the pedestrians walking along the quaysides, almost within touching distance of the boat. One almost feels more like we are in a canal than a marina. Here is our view to the left, then the right, which I shall try to fuse together in a photo-montage, or not perhaps. View to the left. coming into port. Rather fancifully, I tell the others it almost feel like a miniature sort of Venice. They nod politely. This blank, philistine, reaction is to be expected really. They are good, but simple, folk. Not artists or architectural historians but simple physicists and what-not. What do they know of Venice? We search the figure pontoons for an available berth. The town looks great. Once again, even from the deck of our boat, we can see there are more cafes and restaurants here. And, as is routine in Brittany, the inevitable medley of endless Crepe shops, selling traditional Breton pancakes. Once onshore, Mike will soon latch on to a rich seam of English humour, employing Britain’s two worst contributions to world-comedy- scatological reference, and the pun. It all involves comic riffs on the word crepe. He tells us he ‘…Needs one, wants one, just had a really good one”. I shall spare you more examples, of this comic gold dust. Our days, and our towns, our very lives it seems, are split into chapters. We sail out of one town, sail most of the day, then arrive exhausted at another, different town. We shower, eat and sleep. Then, time permitting, we explore town 2 the next day. Then we leave again, for another town. And repeat to fade. So it is with Audierne. We do a stroll before supper. Then I have time for another little foray the next morning. So, if you find the direction light confusing, or inconsistent, in this or any other post, this is the reason why. Both evening and morning Audierne is a delightful sort of place. Sleepy but scrumptious, would be my two adjectives of choice. 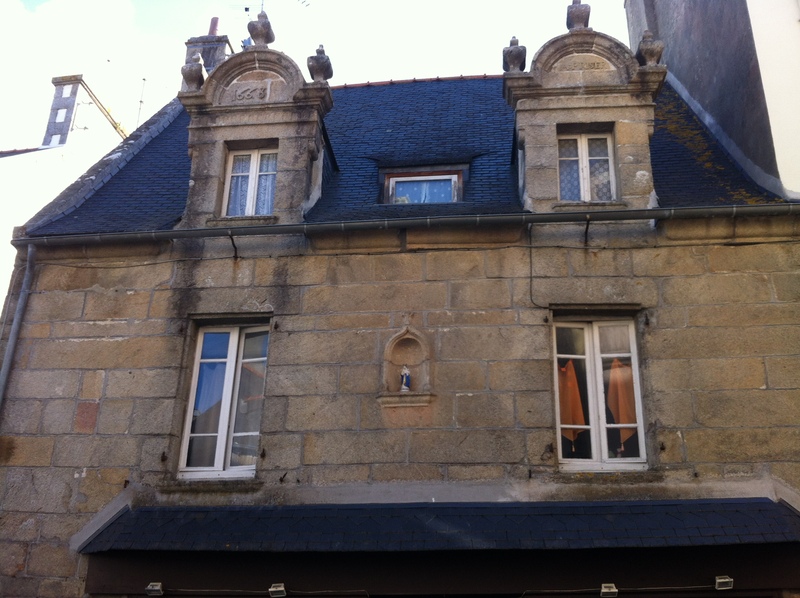 Look at this lovely, sturdy little 17th century house made of granite. It must be indestructible. 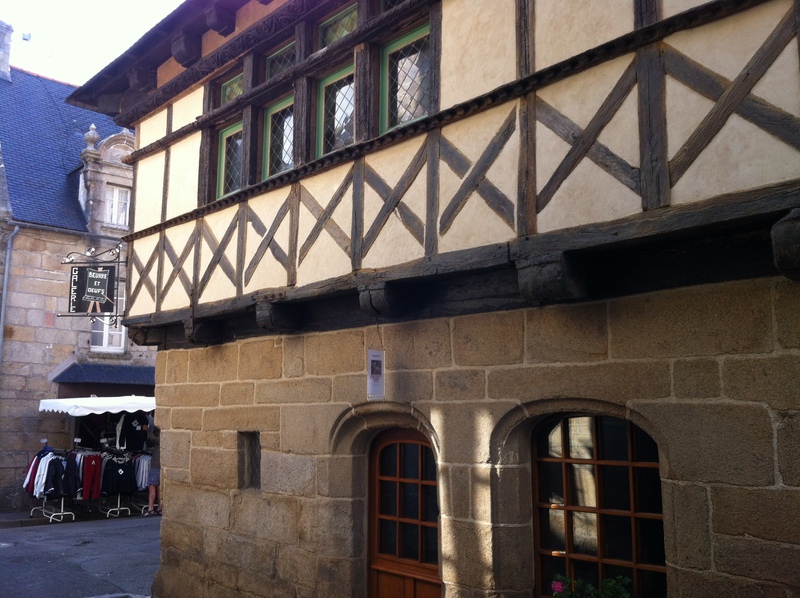 There are houses from the 17th century and even the late medieval period, old timber-framed affairs, hanging over the narrow winding streets. Those streets rise up the hill, to the churches and bell towers beyond. The previous evening, we explored the extensive graveyard, full of ornate memorials, and odd rather un-French sounding names. The names are Breton, Spanish, French occasionally, even Irish. This now sleepy plac used to be somewhere of substance. The changing tides of history, eh? 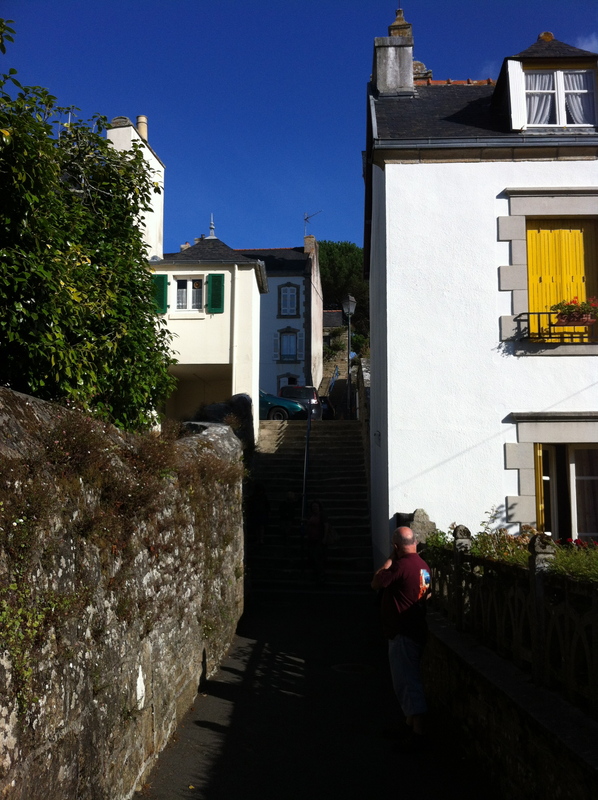 Today.this morning, after a snatched breakfast of croisant and café au lait, we climb the little streets above the harbour. There are merchants houses with painted shutters and neat gardens, sitting high up above the harbour on along the terraced streets. The church is wonderful too, warm granite stone and built to last the storms to sea. Built to last infinity really. It’s all over rather too soon. The tide is turning and we have to leave. Onwards onto the Atlantic again and on to our next port. Sacre blué, sailing in FRance. When will it all end. 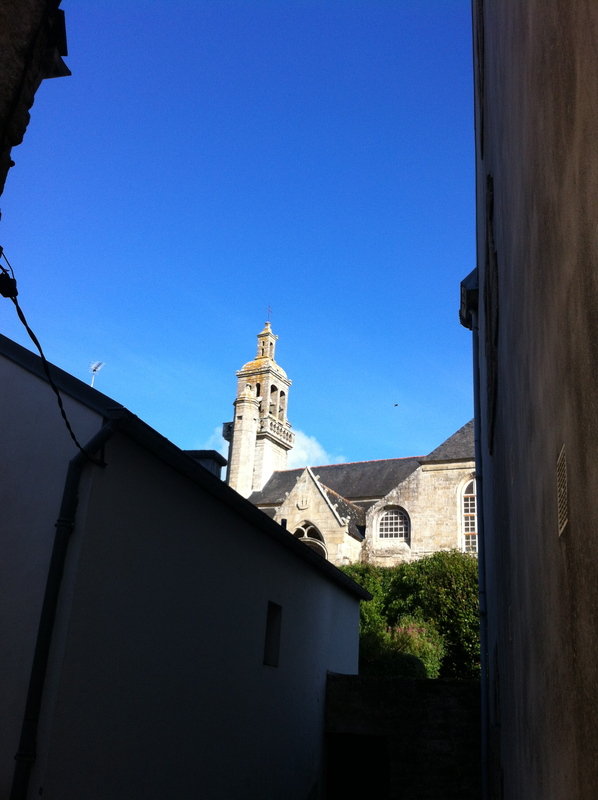 Our next port is the ancient walled city fortress of Concarneau. I hope you’ll join me there. 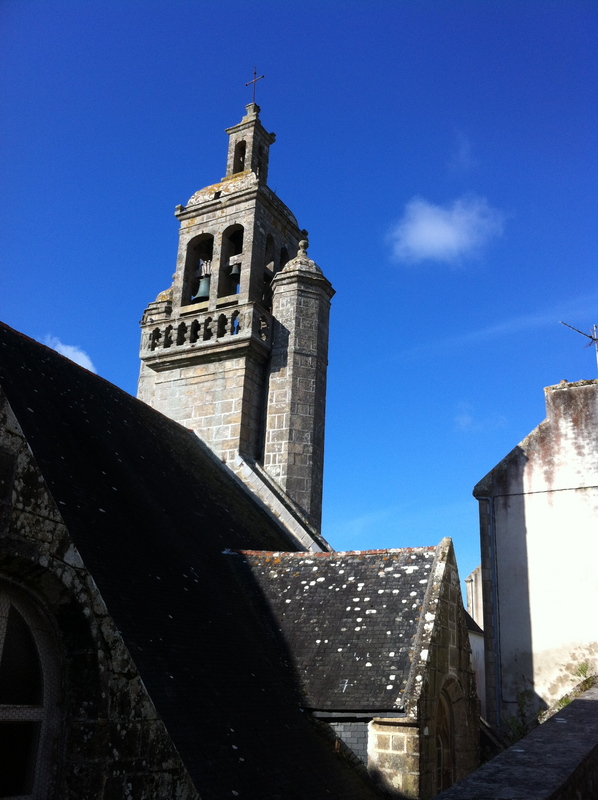 October 11, 2012 April 14, 2013 Arran HendersonArchitecture, Church Architecture, France, UncategorizedBrittany, Finistere, France, Travel Writing. I don’t know how you do it–the astonishing ability to withstand storm and sea, physicist and philistine, a popcorn less bateau… and these insufferable places you sail. 😉 Great read, lovely photos! 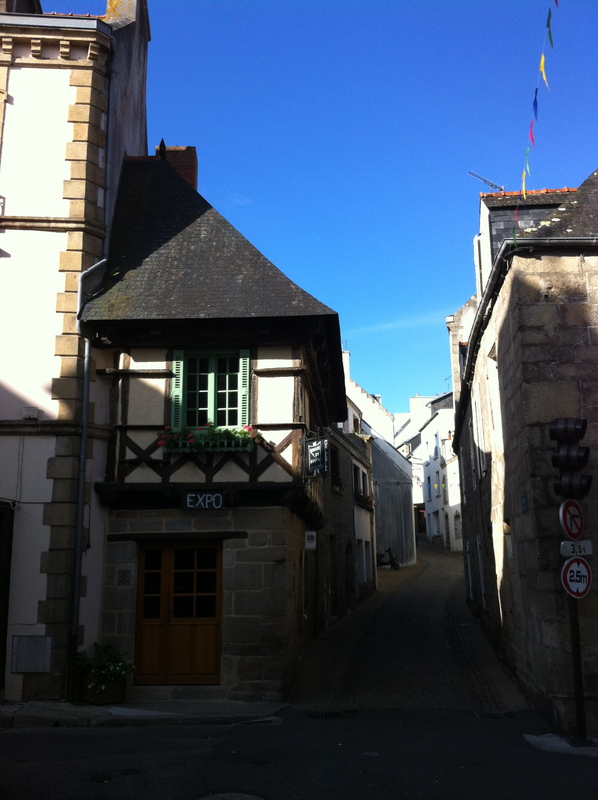 Will see you in Concarneau or Zhenbiancheng Village, whichever comes first. Thank you. You are too kind. See you there, in one place or the other. Looking forward to it. 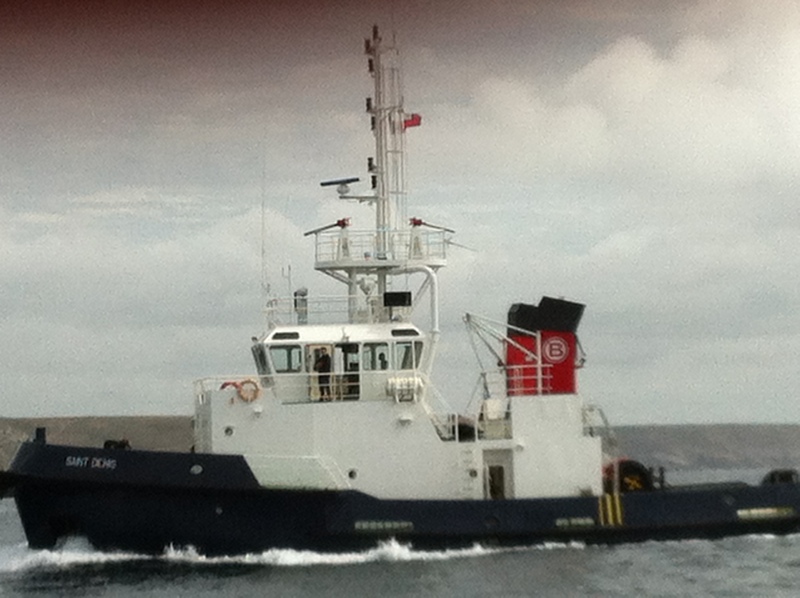 Shame about the tug. But sometimes ugly things must be done. I’m disappointed that my people didn’t build a microwave popcorn maker into that boat, though. And I would have been drooling over that beautiful architecture in Audierne. It was indeed drool-worthy, like so much of lovely old France. Still feel bad about the tug. But what can you do, in the face of such provocation? Nice pictures! Thanks for sharing and have me drooling! my absolute pleasure. thanks for stopping by, and for the nice comments. Please come again. I’ve just pressed on our next port. -Arran. Yeah, the only language these t(h)ugs understand. Previous Post Sailing Brittany VI: the Fellowship of the White Mast. 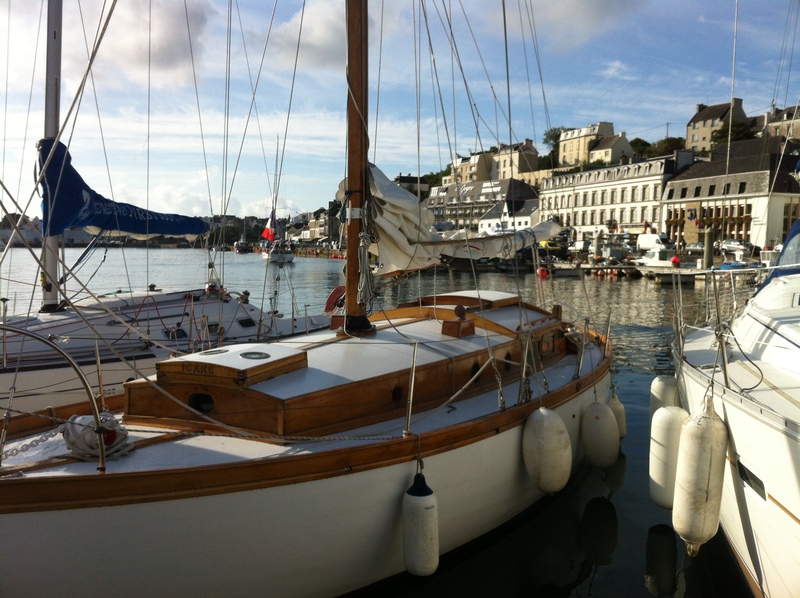 Next Post Sailing Brittany part VII- Audierne to Concarneau.